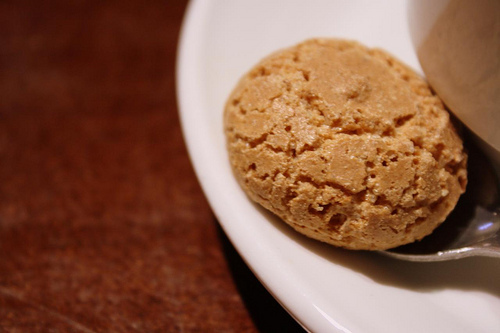 Amaretti are dry, hard biscuits shaped into rounded mounds about the size of an unshelled walnut. They are typically made with almonds, egg whites, and sugar but can be flavoured with cocoa or other flavours. Sometimes almonds are substituted for other nuts such as hazelnuts. Amaretti are found all over Italy. Buy: Amaretti come dry (amaretti a pasta secca), soft (amaretti a pasta morbida), and sprinkled with sugar (amaretti cosparso con zucchero a granella). 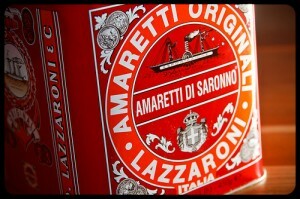 The most famous are from Saronno near Varese but are closely related to the amarettus from Sardegna. Store: Amaretti can be stored for a long time if hermetically sealed to preserve their flavours. Prepare: When used in recipes, the amaretti are often ground, either in a food processor or placed between tea towels and rolled over with a rolling pin. Eat: Amaretti are used to stuff pears and peaches (pesche ripiene), in stuffed pastas (tortelli di zucca mantovani), in fritto misto (fritto misto piemontese), garnish ice cream, in cakes (torta di amaretti), in pastries, and are served as an accompaniment to coffee and puddings (bonet). They can also be eaten on their own. 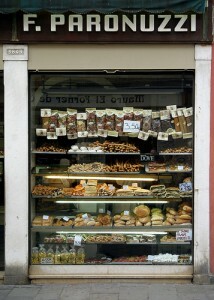 Every area in Italy has different bread and there are more than 1,000 types of bread in Italy. 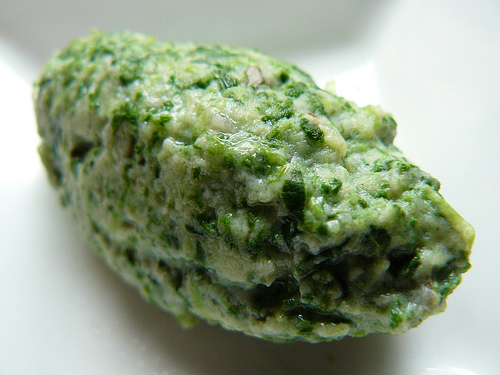 It is probably one of the most discussed foods in Italy. If an Italian moves from one area to another, one of the things they miss the most will be the bread they grew up on. Ordinary bread (pane comune) uses only wheat flour, water, salt, and a rising agent whereas special bread (pane speciale) can have other ingredients or different flour. Breads can be made with whole wheat flour, white flour, semolina (in the south), cornmeal, or rye flour (in the north) mixed with water, a rising agent, and usually salt. They can be flavoured with olives, nuts, cheese, onion, herbs, fruit, honey, or meat. 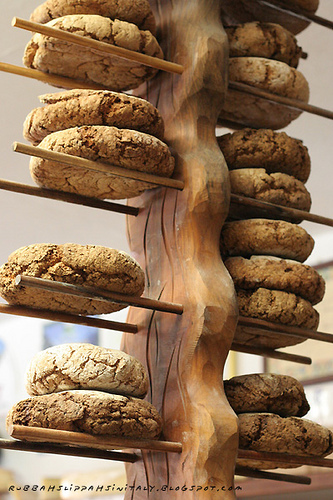 Typical bread shapes are long, round, wreath, rolls, disks, flattened, thin threads, tile, and braid. There are many special shapes used for festive breads. Buy: The best bread is bought from a bakery which has a special bread oven. Home ovens cannot replicate the effect of these commercial ovens, although very nice bread can be made at home. Historically much of the bread was made at home but then taken to a communal oven to be baked properly. 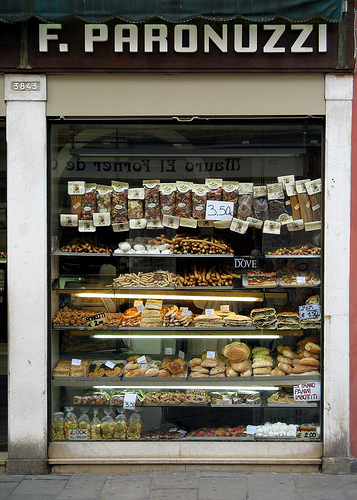 Store: Store bread in a cool, dry place. It should be consumed as soon as purchased although some types of bread can last 1 to 2 days. Prepare: No special preparation is needed. If the bread was not purchased that day, it will improve after being warmed in the oven or toasted. Eat: Bread can be eaten at any time with every type of food. Bread is eaten for breakfast and at lunch and dinner as a starter like bruschetta or crostini, served in soups and salads, made into dumplings (canederli), ground and sprinkled over pastas, used in stuffings, and even dessert (torta nicolotta). Stale breads can be used for salads (panzanella), soups (pappa col pomodoro, pancotto, and ribollita), dressed and served (pancotto), and made into breadcrumbs (see below). Ciabatta means slipper because the bread is shaped like a slipper with a rounded side rectangular low loaf. Ciabattas have a thin crispy crust and are typically made without salt. They originate from Toscana but now can be found throughout Italy. It was traditionally made once a week and is baked directly on the oven floor free form (no tin). It has large irregular holes inside. Stale ciabatta is used in salads and soups as it can be soaked thoroughly and then squeezed without disintegrating. 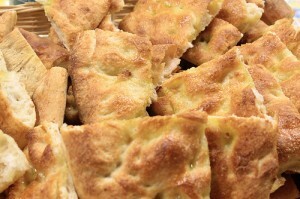 Focaccia is a dimpled, fluffy yeasted bread infused with olive oil and has a range of toppings or fillings to choose from such as onions (focaccia con le cipolle / sardenaria), potatoes, tomato, cheese (focaccia di Recco), olives, rosemary, sage, eggs, walnuts, anchovies, pork cracklings, lard, and oregano. It is baked in the oven on large metal baking tin or in discs. 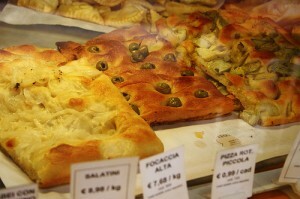 Focaccia is from Liguria but enjoyed throughout Italy, typically eaten as a snack or starter. 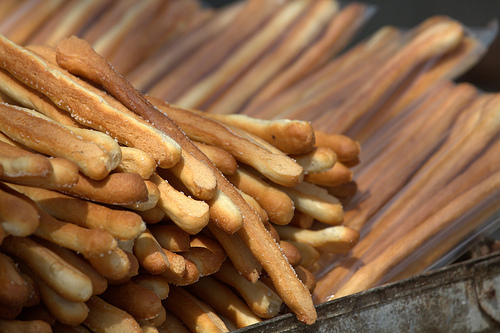 Grissini are long thin breadsticks with a fine, crunchy texture from Piemonte. 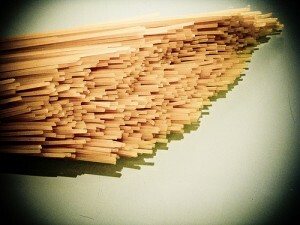 Freshly handmade grissini are incomparable to factory produced grissini. They are made from flour, water, and salt. There also exist versions with whole wheat, olive oil, butter, seeds, cheese, spinach, pancetta, onion, fennel, or herbs. Grissini are eaten with drinks, with starters, or with a meal instead of bread. Grissini are often sold prepackaged with quality varying widely. They should be stored well-sealed in a dry place (but not in a plastic bag). This Tuscan bread is flavoured with sugar, raisins, olive oil, and rosemary and was typically eaten at Easter. Now it is eaten throughout the year. 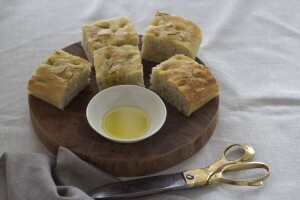 Traditionally pan di ramerino are bread rolls, nowadays there is also a rosemary loaf known as panmarino. Pane nero is a bread made with rye flour from Valle d’Aosta. It is quite hearty and spicy. 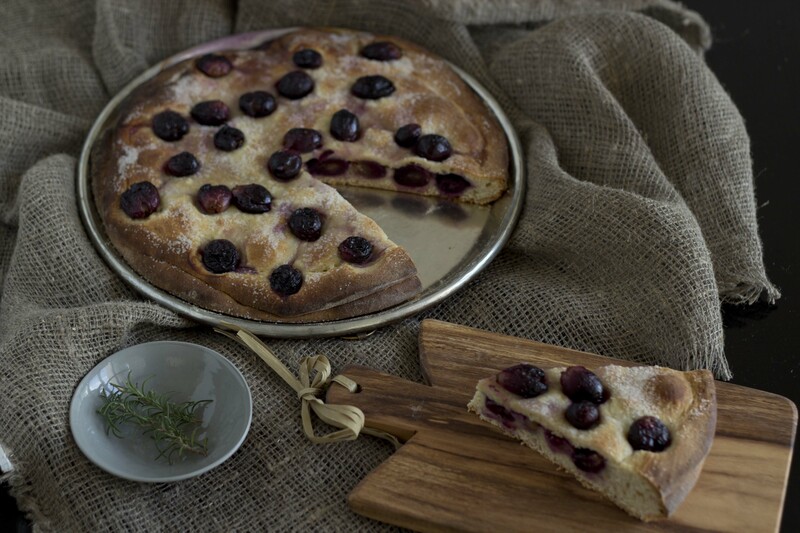 Schiacciata means squashed because the bread is flat. The dough has been squashed with a spoon and sprinkled with olive oil and salt after it has been baked. 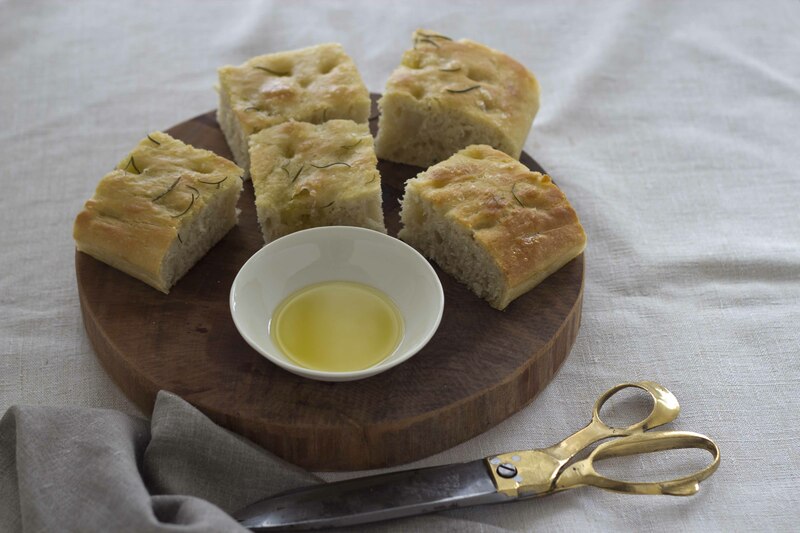 It is generally a variation on focaccia. There is also a crisp bread called schiacciata or schiacciatina which is paper thin and salted, sometimes flavoured with herbs. There is also a sweet version of the fluffier schiacciata using grapes called schiacchiata con l’uva which is traditionally made in the autumn. Both versions are traditionally Tuscan. It is said that historically schiacciata was the last bread to be baked in the oven. Breadcrumbs can be made from fresh and stale bread alike, depending on what a recipe specifically calls for. 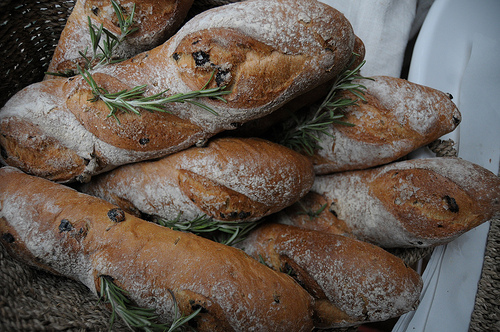 Bread is never left for waste in Italy and resurfaces again and again in different dishes. Buy: You can also buy bags of dried breadcrumbs. I prefer the ones with a larger crumb but this is a matter of preference. Store: Fresh breadcrumbs should be used immediately. Dried breadcrumbs can be stored in an airtight container in a cool, dark, dry place. Prepare: To make fresh breadcrumbs, cut the white bread into slices, remove the crust and then cut the interior of the bread into cubes and then chop them even smaller by hand with a large knife, in a food processor, or grate them. To make dried breadcrumbs, put your stale bread into an oven set to 75˚C until it is dry and golden in colour. Place it inside a clean plastic bag or a cloth and pound it with the side of a knife or a mallet or roll it with a rolling pin until they make crumbs. You can filter out the bigger pieces through a mesh and pound the large pieces again. Breadcrumbs are generally soaked in water, milk or broth prior to using for stuffings, meat balls, and meatloaves. Eat: Breadcrumbs are used to bread and fry meat and vegetables, used in stuffings, made into dumplings (minestra mariconda, passatelli, and minestra del paradiso), soup (stracciatelle), fried with flavourings and used to top pastas and risotto in place of cheese, and used in meatballs and meatloaves, etc. They add crunch to a dish when needed and help more cohesively bind meat dishes while softening the texture. Cornflour is often used in baking to make a batter rich in fats more crisp and for binding sauces and custards. It is also used in glazes to create a smooth and shiny finish. Buy: Cornflour is the pure white finely ground centre of the maize kernel. Look for well sealed containers. It is used as a thickening agent and added to baked goods to give a finer texture. Store: Store well-sealed in a dry place. Prepare: If used in cooking, cornflour often needs to be dissolved first in a cold liquid prior to adding to the dish, typically at the end of cooking. When used in baking it needs to be sifted. Eat: Cornflour is used in many desserts such as biscuits, cakes, and pastries. Cornflour makes the dough more crisp and works well in doughs made with lots of eggs and sugar. It is also used for creams (crema pasticcera) and sauces as a thickener which also helps prevent curdling. Cornflour is preferable to wheat flour when making custard as it thickens at a lower temperature so that the egg has a softer flavour. Arrowroot may be a more preferable substitute when making custard as it thickens at a lower temperature than cornflour ensuring the eggs in the custard do not overcook. Cornflour can be used to substitute 1/3 to ½ of the flour in baking cakes to make them lighter and crisper. If 2/3 of the flour is replaced with cornstarch then the cake will be extremely light. Substitutions: These are approximations as each type of flour is different so there is no perfect substitution. While flour literally means the grinding of any grain, cereal, or pulse, when the word flour is used alone, it typically refers to soft wheat flour. There are many types of flour and each country’s flour is different. There are strong flours for making breads and rustic desserts and soft flour for making pastry, cakes, fresh pasta, and pizza. 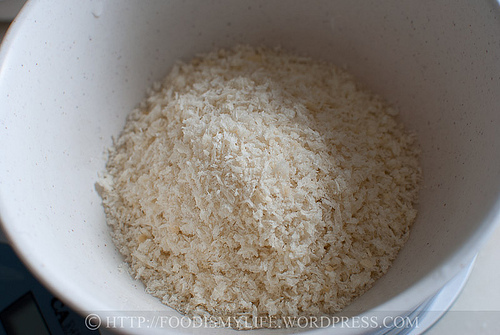 There is also hard semolina flour used to make pasta, breads, dumplings, and cakes. 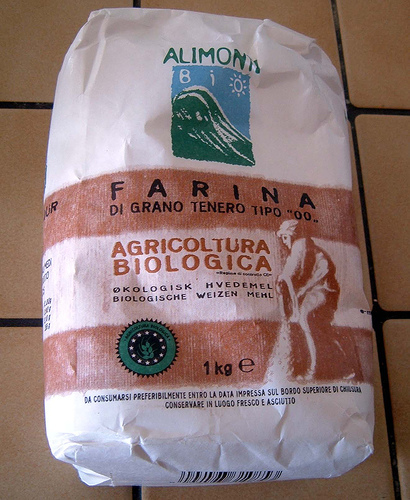 The most-used flour for home use in Italy is 00 flour (see below). Flour is rich in carbohydrates and has a protein content between 7 to 18%. Buy: Check the expiration date on the packaging and look to ensure there are no holes in the bag or signs of pests or moisture. White flour should be uniformly white without any specks. In Italy there are 5 grades of flour depending on the ratio of husk to whole grain the flour contains. 00 is the whitest and silkiest and is the most used for cakes, fresh egg pasta, sauces, and some bread. Soft wheat flour is more typically used in northern Italy. There are five categories of soft wheat flour further classified into soft flour and strong flour. The categories are derived from siftings with the softest flours being the finest. The more coarse the flour, the higher the number until integrale which is the coarsest meaning it is almost entirely bran (so also contains the most protein). About 80% of Italian breads are made with soft flour. Soft flour has lower levels of fibre, gluten, minerals, and vitamins and is used for light breads, cakes, pasta, and sauces. This flour is more delicate in flavour and texture and is very white in colour as almost all the bran has been removed. 00 Flour is used in delicate desserts, biscuits, and pastry. There are many types of 00 flour ranging from 40 to 80% gluten resulting in a different degree of liquid absorbtion. 40% is used to obtain a crispier dough. 80% is used to obtain a softer, fluffier dough. 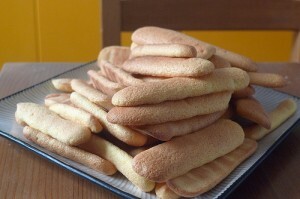 0 Flour is used for less fine pastry, grissini, crackers, pizza, bread, and fresh egg pasta. Strong flour (integrale) has a higher nutritional content and dietary fibre and has greater flavour. It is used for yeasted breads and is rich in gluten so forms an elastic dough. It is more perishable than soft flour so should be freshly milled. 1 Flour is used for more rustic breads and desserts. 2 Flour is used for more rustic breads and desserts. 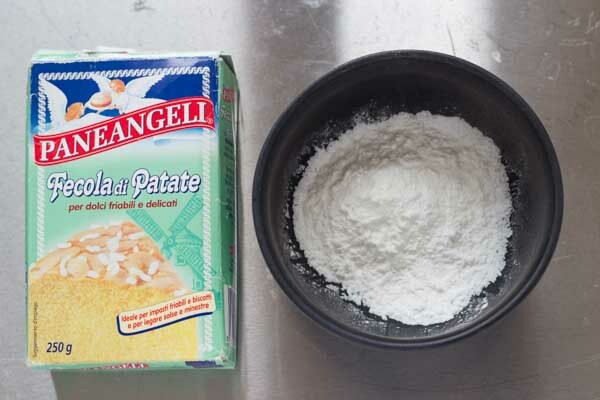 Integrale flour absorbs a greater quantity of water and so does not rise well and does not become elastic and smooth. It is dark in colour due to the high amount of bran or germ. Hard flour is made from durum wheat, and is more typical of central and southern Italian cooking. It is more granular and yellow in colour than soft wheat flour. The more coarse grain is labelled as “semolina” while the finer grain is labelled “semolina rimacinata”. It is primarily used for making pasta with water (without the addition of egg) and dried pasta. It is also used in breads, dumplings, and desserts. In Puglia and Sicilia they use hard flour for breads. Hard durum wheat can be more finely ground (semola rimacinata) and called semolina (semolino). Semolina can be made into dumplings (gnocchi alla romana), used in soups, desserts, biscuits and made into couscous. Kamut (Kamut) (Triticum turanicum turgidum) and other ancient Sicilian grains (such as Tumminia, Russello, Biancolilla, Perciasacchi and Bidi) were rediscovered recently. They have become popular as it is high in protein, low in gluten, low on the GI (glucose index), easily digestible, and has a high content of selenium, a mineral that reduces free radicals that can cause cardiovascular disease. It is often made into dried pasta. When I can find kamut or tumminia pasta, I buy it. Note: American flours are harder and higher in gluten and protein than Italian flour. American flours usually have azodicarbonamide added to the flour to mature it and help strengthen the gluten, elasticity, and rising of the dough. It is activated when the flour is mixed into a dough. If you cannot find Italian flour, it is better to use British or French flour which are weaker and have a higher starch content. All-purpose flour is an American flour made from a blend of soft, medium, and strong wheats which have been milled and refined. It can be used for breads, cakes, and sauces. Bread flour is a high-gluten flour milled from hard wheat and has a high protein content. It is often blended with low-gluten flours to create dough with more strength and elasticity. It is used to make American style breads and pizza but is not good for making Italian breads. Bread flour is slightly coarse and cannot be squeezed into a lump. Cake flour is an American flour made from soft wheat with very little gluten so it is perfect for light, delicate baked goods such as high-ratio cakes, jelly rolls, and biscuits. It has a higher gluten content than Italian flour so it is good for making pasta. It has a diminished starch content so will react differently to moisture. Pastry flour is an American flour made from soft wheat with a low gluten content, slightly more than cake flour, and is used to make tart and pastry doughs, cakes, pastries, and cookies. Pastry flour is smooth and fine and can be squeezed into a lump. Plain flour is a British flour made of refined and bleached soft wheat. It has only a small amount of gluten so produces a light texture which is perfect for cakes, biscuits, and shortcrust pastry. Self-raising flour is an American flour with wheat flour that has been mixed with baking powder and salt. As baking powder loses its potency over time, self-rising flour should be used within 2 to 3 months of production. It is used for making cakes and breads. Strong flour / Strong plain white flour is a British flour made of soft and hard wheats. It has almost no bran or germ and so are fortified with the nutrients later in the process. It is suitable for yeasted breads, pizza, puff pastry, and flakey pastry as it has a high gluten content, which gives a stronger crumb structure. Stone ground (macinatura a pietra) is a traditional technique of slowly grinding. The reduction in velocity reduces the temperature and so the risk of cooking the grain, improving the flavour. The essential oils also blend with the starch so the flour has the best flavour, aroma, and nutritional qualities such as an elevated level of enzymes and vitamins. It makes a very dense bread so is often mixed with more refined flours. It is more perishable than normal flour, lasting only 5 to 6 months after production. Unbleached flour has been matured and whitened naturally so has better flavour than the artificially whitened “bleached” variety. Store: Store in a sealed container in a cool, dry place for 8 to 14 months after production. Stone ground flours will only last 5-6 months after production. Semolina goes stale quickly even if well sealed so purchase it when you need to use it. Prepare: Most flour needs no preparation. In some desserts, the recipe may call for the flour to be sifted to aerate it. Eat: Flour is not only used to make breads, pastries, crispbreads, flatbreads, biscuits, pastry, and cakes but is also used to thicken sauces (besciamella), batter meat, vegetables, and fruit for deep-frying, make soup (zuppa di cipolle e farina tostata), and to flour meat for frying to add colour and flavour before braising or stewing. Semolina is used to make desserts, soups (minestra viterbese, zuppa Bolognese and minestra di semolino), couscous, pasta (orecchiette, lagane and maccheroni), and dumplings (gnocchi alla romana). Pasta was legendarily introduced from China to Italy by Marco Polo. This story is generally considered a myth as pasta already existed in Sicily prior to Marco Polo’s famous trip to the East. Pasta was quite likely introduced by the Arabs from the Middle East. Historically pasta was eaten daily only in southern Italy while in northern Italy risotto was eaten daily; this has changed. The word “pasta” in Italian simply means dough and could refer to bread dough, pastry, or pasta (pasta alimentare). 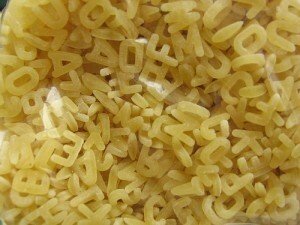 The word “pasta” used on its own will typically refer to dried pasta. Pasta is typically divided into two categories: fresh pasta (pasta fresca) and dried pasta (pasta secca / pastasciutta). Fresh pasta is not necessarily better than dried pasta (a common misperception) as this will depend on how it was made. Pasta in Italy is never served as a side dish to other dishes (although it can be added to broth, stews, soups, or beans) as it is in other countries. It is served as a first course (primo) following the starter (antipasto) and before the main course (secondo). Prepare: Boil in a large pot or pasta pentola. Once the water begins to boil, add salt. After a couple of minutes, when the water returns to a boil, add the pasta, stirring with a large fork, pasta fork, or pasta tongs and ensuring it is completely immersed in the water. Keep stirring from time to time to ensure the pasta does not stick. Pasta cooking times vary according to shape, thickness, and if it is fresh or dried. IV. Thou shalt cook pasta until “al dente” for dried pasta or “a punto” for fresh pasta so that it is firm and elastic and is not soft, waterlogged, or falling apart. Eat: Pasta is most typically boiled and dressed. It can also be dressed and baked (lasagne al forno, cannelloni, timballi, pasta infornata, pasticcio di cappelletti). It can be stuffed, boiled or baked, and dressed or served in broth (tortellini in brodo, ravioli, pansoti, capelletti, agnolini, tortelloni). Pasta can be added to broths, soups (minestrone), stews (maltagliati), and beans (pasta e fagioli). Fresh pasta is normally handmade from soft wheat flour (0 or 00 flour) and/or semolina with eggs or water at home, in restaurants, or by speciality shops. Additional flavourings or fats can be added and other flours such as buckwheat flour substituted. Fresh pasta will vary by region for example in Emilia fresh pasta is made with 00 flour and eggs while in southern Italy it is made with semolina, flour, and water. 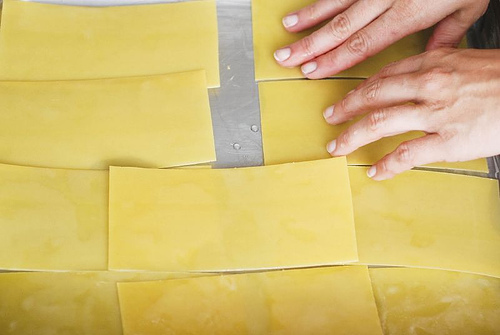 Buy/Make: If not made at home, fresh pasta is sold refrigerated as it is highly perishable. 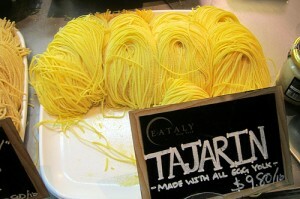 Typically it is sold at pastafresca shops (shops that specialise in fresh pasta and pasta sauces) or in gourmet shops. Industrially produced fresh egg pasta is often inferior to industrially produced dried egg pasta. Most stuffed pastas (pasta ripiena) are made with fresh pasta. In northern Italy, types 00 and 0 flours are typically used to make fresh pasta while in southern Italy, hard durum wheat is typically used. Other types of flour used include kamut (grano kamut– a favourite of mine), buckwheat (grano saraceno), chestnut (castagne), barley (castagne essicate), and emmer wheat (farro). Pasta can also be coloured. Traditional colours are green (spinach or borage), yellow (saffron) and black (cuttlefish ink). Modern colours include red (tomato or pepper), orange (carrot or pumpkin), purple (beet), and brown (cocoa) but I don’t recommend these. Cappelletti are 2-4 cm wide stuffed pastas (pasta ripiena) made with fresh pasta that is made with type 0 flour and eggs. The name means “little hat” as the shape resembles a hat worn in medieval times. They can be filled with meat, cheese, vegetables, lemon zest, herbs, candied citron, and/or nutmeg. They are normally served in a meat broth and are found in Emilia-Romagna, Lazio, Marche, and Umbria. The two main types are cappelletti reggiani which are filled with meat, prosciutto, breadcrumbs, and Parmigiano-Reggiano cheese and cappelletti romagnoli which are filled with Parmigiano-Reggiano cheese, ricotta or Raviggiolo cheese, and spinach or chard. When served dry, they are dressed with butter and Parmigiano-Reggiano cheese or garlic, olive oil, and truffles. They are traditionally served at Christmas. 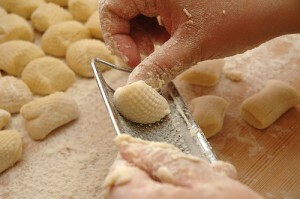 Gnocco / Gnocchi / Gnocchetti are pieces of pasta or dumplings which can be made with wheat flour (gnocchi alla lariana), chestnut flour (gnocchi ossolani), semolina (gnocchi alla romana, gnoches de gries), cornflour (gnocchi del prete), polenta (gnocchi di polenta, matuffi), ricotta cheese (gnocchi di ricotta), buckwheat (gnocchi di grano saraceno), breadcrumbs (gnocchi di pane), potatoes (gnocchi di patate, gnocchi di latte), pumpkin (gnocchi di zucca, gnocchi ossolani), plums (gnocchi di susine), greens (gnocchi verdi, gnocchi di spinaci), water, or eggs. There are dry gnocchi which are made with just flour and water and potato gnocchi sold in cryovac packaging. Sizes vary but they are generally are about 1 cm wide by 2 cm long. Gnocchi may have a smooth, ridged, or bumpy texture. They are normally made fresh and boiled or baked. Gnocchi can be dressed with cheese (gnocchi alla bava), tomato sauce (gnocchi alla sorrentina, gnocchi della vigilia) or butter and cheese (gnocchi di patate alla veronese, gnocchi di pane, gnocchi di grano saraceno, gnocchi del prete, gnocchi di polenta, gnocchi di ricotta) as well as sweet gnocchi (gnocchi con il cacao, gnocchi di susine, gnocchi dolci di Natale). Pansotti are a stuffed pasta in the shape of a triangle from Liguria. The pasta is made of wheat flour, water, and white wine and is cut into 8 cm squares which are folded over. They are traditionally stuffed with preboggion (mixed wild herbs and greens), ricotta or prescinseua (curd cheese), Parmigiano-Reggiano cheese, egg, and garlic and dressed with salsa di noci (walnut sauce). 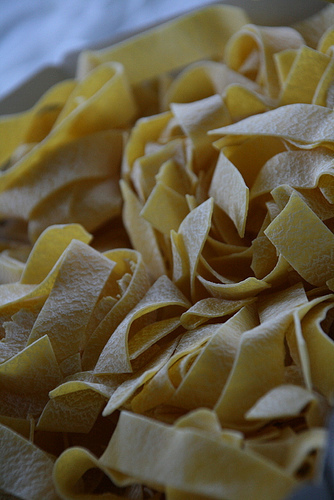 Pappardelle are large, flat, long ribbon pasta from Toscana, which are about 3 cm in width. The name comes from a word in Tuscan dialect, “pappare” which means “to eat”. When homemade, they are made with wheat flour and water or eggs but the ratio of flour is slightly higher than usual (3 eggs per 350 grams of flour with a bit of water added to compensate). When produced industrially, they are made with durum-wheat flour and water and tend to be longer. 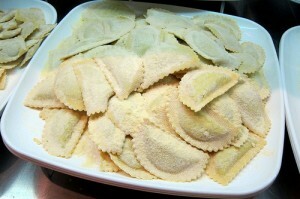 They are traditionally dressed with meat sauces such as hare stew (pappardelle con la lepre). Tajarin is a long thin pasta made of wheat flour, egg yolks, and salt, sometimes with oil, butter, or white wine. 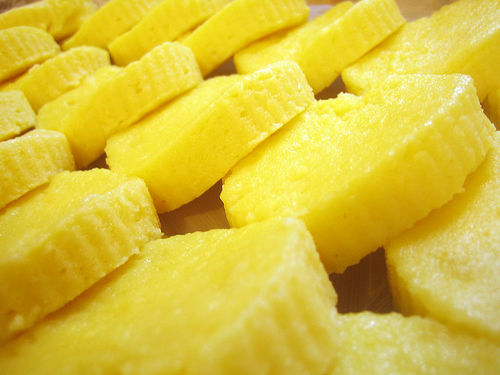 There is a variation made with corn flour (tajarin di meliga). Tajarin are 3 to 4 mm in width. It is from Piedmont and is served with white truffle (tajarin al tartufo), roasted meat gravy (tajarin al brucio), or a meat sauce made from organ meats (comodino) or chicken livers (sugo di fegatini). It can also be served with tomato and basil or butter and sage. Store: Fresh pasta can be stored, sealed in the refrigerator for up to 2 days. For longer conservation, it needs to be completely dried or frozen. Prepare: Fresh pasta is traditionally made on a wooden board using a wooden rolling pin but today most homemade pasta is made using a pasta rolling machine. Making fresh pasta at home is an acquired skill. Fresh pasta is made with flour and eggs or water, sometimes with the addition of flavourings such as white wine, saffron, squid ink, spinach, etc. Fresh egg pasta (pasta all’uovo) is typically made with 100 grams of flour per egg but this depends on the size of the eggs and the how much liquid the flour can absorb. Fresh pasta can be cut and shaped in a variety of ways: by being cut with a knife (maltagliati, sagne, fazzoletti), by using a pasta wheel (sfrisolate), by tearing (pasta strappata), rolling it around a needle (maccheroni bobbiesi, maccheroni al ferretto, fusilli, fileja), rolling it across a chitarra (a special tool with wires drawn across a frame) (macchernoi alla chitarra), rolling it with a textured tool such as a sieve or grooved rolling pin or board (malloreddus), stamping it (corzetti), grating it (pasta trita) and using the fingers to make special shapes (trofie, orecchiette, cavatelli, pici, lorighittas, strascinati) or a combination of the above (garganelli, farfalle). See the “Prepare” section above. Cooking times vary for fresh pasta depending on how fresh they are, how thick they have been rolled, the shape, and if vegetables were used (accelerates the cooking). The cooking time is usually brief in comparison to dried pasta. 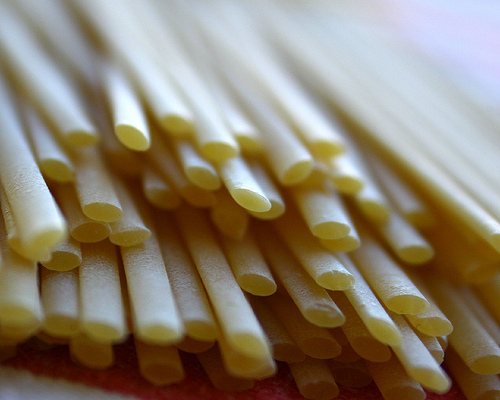 The desired texture, typically referred to as “a punto” or “al dente”, is different to that of dried pasta as it is softer, silkier, and less elastic than dried pasta. Use warmed bowls for serving pasta. Dried pasta is normally industrially produced from hard durum wheat flour or kamut flour and water. 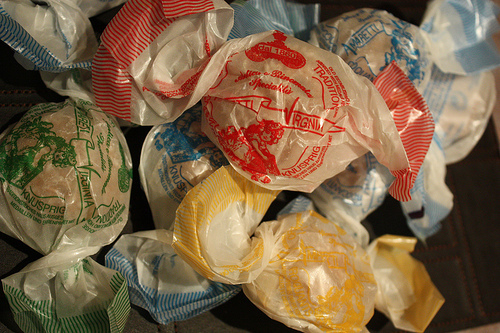 It was invented in the 20th century in Naples and has since become an Italian staple. Two of the most popular brands are DeCecco and Barilla. Buy: Dried pasta is packaged and sold dry with a long shelf life. The pasta should be uniform in colour and free from any greyish tinge. Thin pastas should be translucent when held up to the light. Egg pastas should be a bright yellow colour. They are typically sold in packages of 500 grams but can also be sold in 100 gm, 250 gm, and 1 kilo packets. There are also dried pastas which are made with eggs, spinach, tomatoes, buckwheat, kamut, or whole wheat. If there is a window in the packaging, check to ensure that the pasta is not broken or crumbling and that it is pest free. More artisanally produced dried pastas will have extended drying times (40 to 80 hours versus 32 hours for industrially produced pasta) and use bronze plates for shaping or cutting the pasta to give it more texture that helps the pasta retain the sauce. 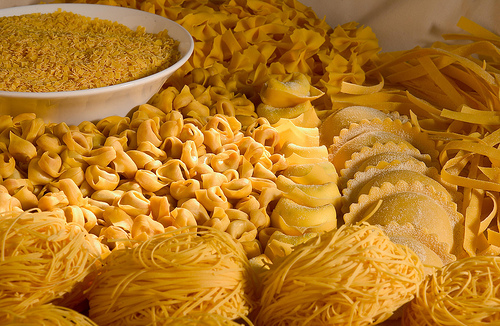 Dried pasta can be long or short, solid or hollow, ridged or smooth, and rounded or flat, each shape suitable to a certain type of dressing. Generally speaking, long pasta (pasta lunga), such as spaghetti, are more suitable to olive oil based sauces which keep the strands separate. Butter, cream, and cheese sauces are best paired with thick long pasta or short tubular pasta (pasta corta). Large tubular pasta such as rigatoni, cannelloni, and penne are better for baked dishes. There are also coloured pastas (pasta colorata / pasta aromatizzata) flavoured with squid ink (black), saffron (yellow), green (spinach), red (tomato), and brown (mushroom). Aside from the black, green, and yellow pastas, I find the rest gimmicky, particularly any pasta with multiple colours. Store: Dried pasta should be kept in a sealed container in a dry place. It can be kept for years at room temperature but always follow the expiration date on the packaging. Prepare: See the “Prepare” section above. Pasta cooking times vary from 2 to 30 minutes depending on their thickness and shape so follow the suggested cooking times on the packaging and taste often to achieve the desired texture. The consistency of the pasta is extremely important to Italians. The desired texture is rather subjective with a strong preference for less cooked pasta, or “verde”, the further south one travels in Italy. Overall there is an agreement that pasta cooked “al dente” (meaning to the tooth) is acceptable. 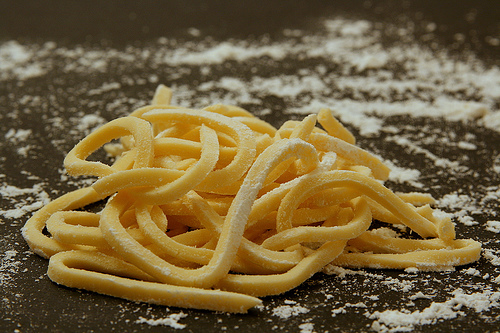 Pasta cooked “al dente” should not be hard or soft but should still be firm, offer resistance, and be elastic. It can be drained in a colander or lifted from the water using a fork or tongs. Use warmed bowls for serving pasta. Leftover pasta can be used to make an omelette (pasta frittata). 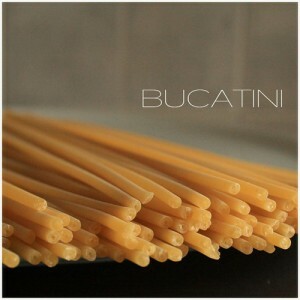 Bucatini are made with durum wheat and water and are up to 10 cm long, thick and tubular. They are about 2.5 to 3 mm in width with the hole about 1 mm wide. The name means “pierced”, as they are long factory made pasta strings with a hole in the centre that ranges in size. Although bucatini originate from Napoli, they are typically eaten in central and southern Italy, particularly Lazio. They are also found in Liguria. It is traditionally dressed with richly flavoured sauces made from butter, eggs (carbonara), pancetta (alla amatriciana, alla gricia), vegetables, and cheese which are made liquid enough so that the sauce also fills the hole. 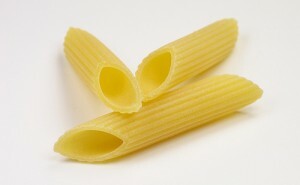 A thinner version of bucatini are perciatelli whereas thicker varieties are ziti lunghi and candele. Lasagne these are sheets of pasta made with 0 or 00 flour, eggs, and with or without spinach (lasagne verdi) and with or without egg. They can also be bought or made fresh. Lasagne is made of varying dimensions but the classic size is 5 x 12.5 cm. Lasagne which are narrower (2-3 cm) and longer (12-15 cm) are labelled “mezze lasagne” and tend to be cooked and served like other long pasta. Lasagne with a ruffled edge are labelled “lasagne riccia / doppio festone”. Some lasagne are able to be dressed while dry and baked and others need to boiled beforehand. The name comes from a Latin word, “lasanum” which means “kitchen pot” referring to what was being cooked in the pot. Lasagne are layered with a variety of dressings including pesto (lasagne al pesto); meat sauce and béchamel (lasagne alla bolognese); vin santo, béchamel sauce, meat sauce, mushrooms, cheese, and butter (vincisgrassi from the Marche); seafood (lasagne ai frutti di mare); tomato sauce and ricotta salata cheese (lasagne alla calabrese) and sausage, meatballs, cheese, eggs, and meat sauce (lasagne napoletana / lasagne di Carnevale from Napoli in Campania). Lasagne made with fresh pasta will cook in a few minutes whereas dried pasta will require much longer in the oven. Maccheroni to northern and central Italians means any industrially produced tubular or twisted pasta including penne, ziti, etc. 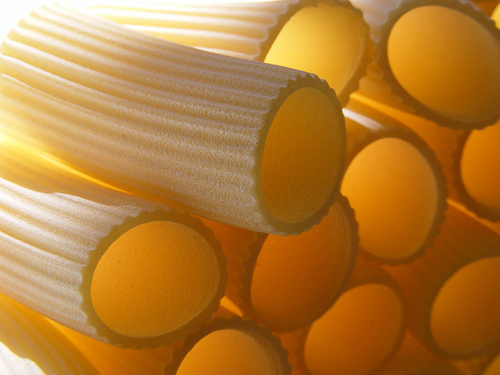 Southern Italians, particularly from Napoli, call any durum wheat semolina pasta long or short, hollow or solid, “maccheroni”. In some regions, maccheroni refers to homemade fresh pasta. Abroad, the word “macaroni” means a shell shaped pasta. Maccheroni alla chitarra is a square-edged pasta, typically 30 cm in length, made from durum wheat flour and eggs or water. 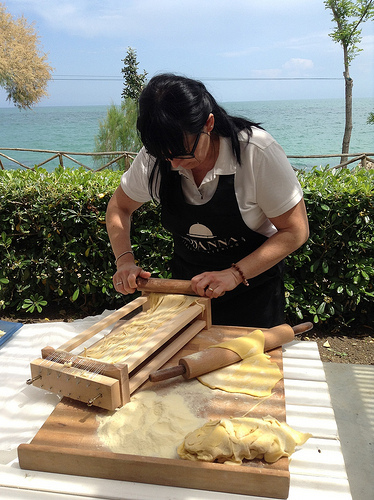 The dough is rolled and then cut on a chitarra (a special stringed tool called a guitar). 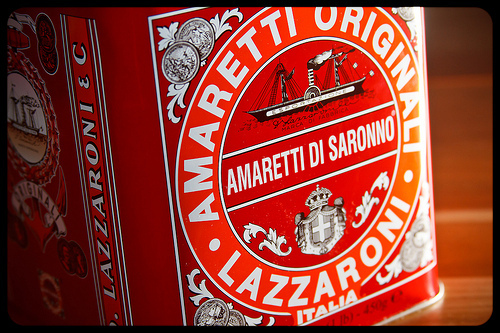 Although it originates from Abruzzo, it is also found in Lazio, the Marche, and Puglia. It is traditionally served with tomato sauce and small meatballs. Malloreddus / Malloreddos are small gnocchi from Sardegna. They are made with durum wheat flour, saffron, water, and salt, sometimes with barley (maccarronis de orgiu). They are shaped by flattening small pieces of dough with the thumb and rolling it agross a ciurili (wicker basket) to give it texture. Malloreddus means “calves”. 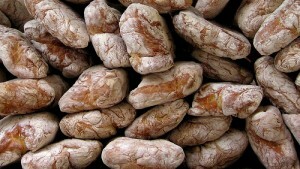 The industrially produced malloreddus are called gnocchetti sardi. They are served with meat or sausage sauces (malloredos cun ghisadu) and pecorino cheese or tomato and basil (al pomodoro e basilico). 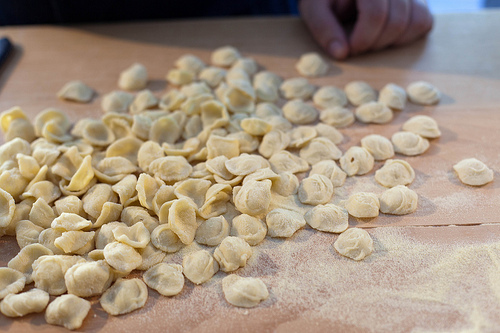 Orecchiette are cup-shaped pasta of various sizes made of durum wheat flour, type 0 wheat flour, and water, sometimes with some whole-wheat flour. The name means “little ears” referring to the shape created by pressing down with the thumb to create a cup. 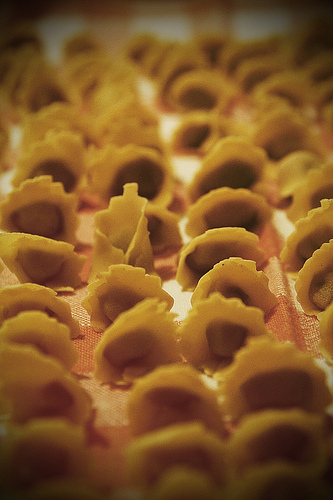 Orecchiette are a traditional pasta from Puglia and Basilicata where they are still made at home. Typically orecchiette are commercially produced. Traditional dressings include tomato sauce and cheese (con salsa di pomodoro e ricotta schianata, con cacioricotta, alla ricotta forte), lamb ragù (alla maternal), turnip tops with anchovies, garlic, chilli, and olive oil (orecchiette con le cime di rapa) and tomatoes and rocket (alla rucola). Pastina This is a general name for tiny pasta of various shapes served in broth. They are made of durum-wheat flour and eggs or water. They are a favourite for feeding babies and young children since they need not be chewed. Shapes include star (stelline, stelle), rice-shaped (risi), alphabet letter shaped (alfabeto), barley shaped (d’orzo), bows (fiocchietti) and ring-shaped (anellini, occhialini, pepe bucato, routine, tubetto minuto). Penne are a short tubular pasta which can have either a smooth (lisce) or ridged (rigate) surface. It is made from durum-wheat flour and water and originates from Campania. Penne are about 1 cm wide and 5-6 cm long. 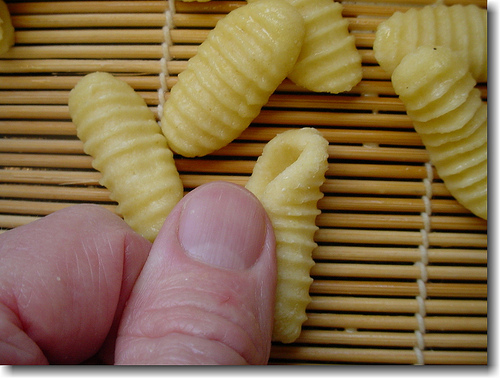 Mezze penne are half the length but the same width while pennette are 4 cm long and 4.5 mm wide. The name means “quills” referring to the shape of antique pens. Penne is dressed with meat sauces, tomato sauces (all’arrabbiata), artichokes (con i carciofi) and is used in baked dishes (timballo). Rigatoni is a medium-sized tubular pasta with ridges made from durum wheat flour and water. It ranges from 4-8 cm in length and 1-1.5 cm in width with a hole ranging from 1 cm wide or larger. The name comes from the word “rigato” meaning “ridged”. 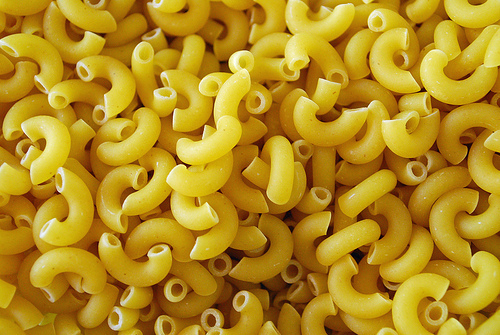 It is a favourite pasta shape in southern Italy. It is dressed with meat sauces (con la pajata, ragù napoletana, garofaolato), tomato sauce (col pomodoro), sausage (alla norcina, con ricotta e sugo di salsiccia) or is optimal in baked dishes (imbottiti). Spaghetti / Vermicelli is the most renowned of the pasta shapes and its name means “little strings” referring to its shape. It is made from durum-wheat flour and water. Spaghetti ranges in width from 1.2 to 2.05 mm and in length from 26 to 29 cm. Thinner varieties are capellini, capelli d’angelo, spaghettini, and vermicellini whereas thicker varieties are spaghettoni and vermicelloni. Spaghetti should be drained so that it still has some of the cooking water attached to it. It is most suited to oil based sauces (alla Boscaiola, alla Carrettiera, alla Sirucsana, aglio e olio, alla norcina, coi carciofi, con la cipolla), tomato sauces (alla puttanesca, alla Norma, alla puttanesca) seafood sauces (con le alici, ai ricci di mare, con il tonno, con le telline, alla taranta all anguilla e frutta di mare) or cheese sauces (cacio e pepe). Trenette are a flat, long pasta ribbons from Liguria made from durum wheat flour and water. When whole wheat flour is added, they are then called “trenette avvantaggiate”. They are similar to linguine and bavette but are wider. Even wider are tagliatelle and the wides are fettucine, lasagnette and pappardelle. 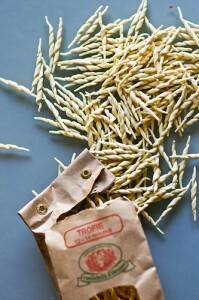 Trofie is a short pasta which is spindle shaped, tapering at the ends, from Liguria. It is made from durum wheat flour. Homemade trofie will use wheat flour enriched with bran instead of durum wheat flour and may also include bran, potatoes, bread, or chestnut flour. The name derives from a Greek word meaning “nourishment”. They are traditionally served with pesto, potatoes, and green beans (al pesto avvantaggiato), or pesto with fava beans. They are also dressed with mushrooms, meat sauce, or fish. 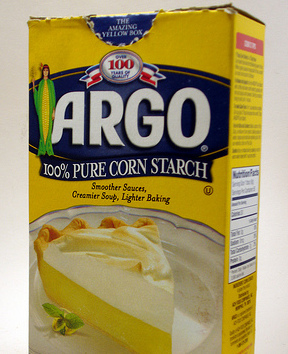 Potato starch is used in desserts and breads. It makes baked products lighter and more moist and prolongs their shelf life. Italy is Europe’s leading rice country. There are 50 varieties of rice grown in Italy which are divided into four categories starting with the shortest grain: commune / ordinario, semifino, fino, and superfino. Rice is often eaten in northern Italy, particularly in Veneto, Lombardia, and Piemonte, and is less popular in southern Italy. Rice is most frequently made into risotto which is considered to be a refined dish since it takes great technique to prepare properly. Risotto is cooked gently and carefully to ensure the proper texture. It is then dressed with different sauces that can include cheese, vegetables (popular in Veneto), fish and seafood (popular in Veneto), meat (popular in Lombardia and Piemonte), or aromatics. Buy: Risotto is sold in boxes or bags labelled with the category and variety of rice. The variety purchased will depend on the dish. Superfino varieties are the best for making risotto. 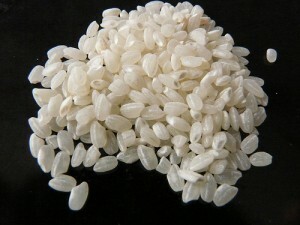 Commune / Originario is a small, short, round, opaque or pearl grain rice used for soups, broths and desserts. It is slightly resistant to cooking and takes 12 to 13 minutes to cook. Semifino is a medium length round pearl grain used for soups, timbales, and croquettes. It takes 13 to 15 minutes to cook. Fino is more elongated in shape with tapered or semi-tapered grains and is good for risotto and fillings for stuffed vegetables, timbales, and moulds. This grain can absorb a lot of liquid without breaking up. It takes 14 to 16 minutes to cook. Superfino is a long or very long grain, starchy rice which is best for risotto. When cooked, the starch is released but the centre remains firm. This contrast in textures is highly valued. This grain can absorb a lot of liquid without breaking up. It is very resistant to cooking and takes 16 to 20 minutes to cook depending on the variety. Parboiling is where the rice is pre-cooked quickly to make the rice quicker to cook at home. It is fine for rice salads but is not suitable for risotto. Riso integrale / Sbramato is unrefined rice which still contains the germ. Store: Store rice sealed in a cool, dry place at room temperature. It can be stored for months. Unrefined rice is more perishable. Sunlight can turn the oils rancid. Cooked rice can be stored sealed in the refrigerator for 3 to 4 days. Prepare: Never rinse or boil and drain risotto rice as it is prized for its starch content which will be lost using these processes. To make risotto, use a heavy, wide, deep saucepan with rounded bottom to ensure even cooking. The rice should be toasted first in butter or oil (tostatura) for 4 to 5 minutes until the rice glistens. If onions are used, they must be slowly cooked in butter, never taking on colour. Risotto must be watched and stirred constantly with a wooden spoon, slowly adding a liquid bit by bit, never allowing the rice to stick to the pan. It should be tender with a firm centre, swimming in a creamy liquid (all’onda) with some butter added just before the end of cooking and allowed to rest. Eat: Rice is used in risotto (risotto nero, risi e bisi, risotto alla milanese, risotto primavera, risotto bianco), boiled and dressed (riso in cagnone), boiled and baked (riso arrosto, riso in tortiera, tiella di riso con le cozze), stuffings, timbales (bomba di riso, sartù di riso alla napoletana), salads and soups (minestrone, riso in brodo, riso e castagne, riso e latte). Leftover risotto is often made into pan-fried cakes (risotto al salto) or deep-fried croquettes (supplì, arancini).